Initially developed for the transport of U.S. Navy dolphins, the Biologics Dolphin therapy surface provides Fluid Immersion Simulation ™, reducing soft tissue distortion and promoting blood flow. In addition to wound prevention, the Dolphin FIS is clinically effective at accelerating the healing of advanced stage wounds, multiple pressure ulcers, flaps, skin grafts, burns and other wound conditions. This easy-to-use mobile system is available for most frames, such as operating room tables. 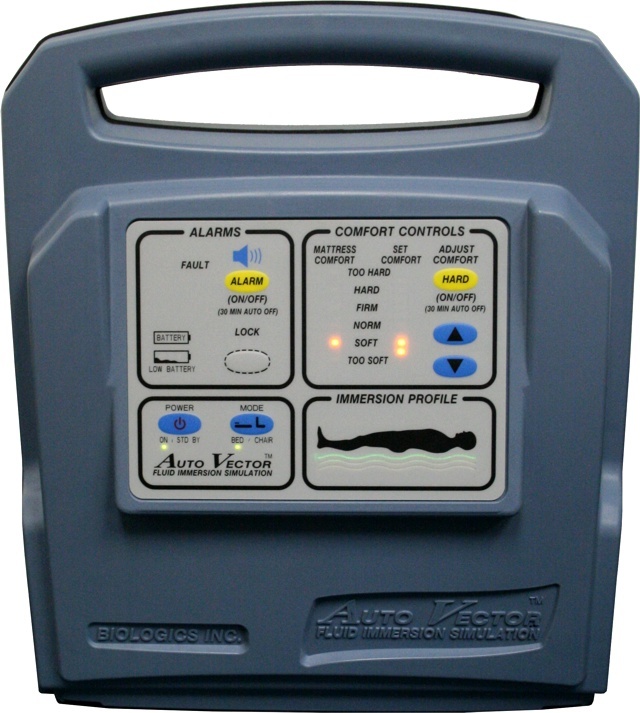 Our Auto-Vector FIS™ Unit offers a unique display of patient's "Immersion Profile" indicating the presence of harmful shear forces and subsequent validation of corrective action taken. Fluid Immersion SimulationTM (FIS) is a state of the art pressure redistribution technology that mimics floating in water and dynamically reduces undesired soft tissue deformation. Patients on our surfaces achieve equilibrium with the mattress surface. Any pressures reflected against the patient are equally distributed as you would experience while floating on water.